I have a 1974 Hosteler Mixte bike, which I bought new for $149.95 that year in Duluth, Minnesota. I haven’t found very much at all about Hosteler bikes online. I’d love to know how many were sold in the U.S. in the 70s. This may not be a detailed-enough picture–if not, let me know and I’ll take more. I’ve ridden it a lot, but not much in the past 10 years. The longest ride I’ve taken with it is 50-60 miles. It’s never been left outdoors–always garaged. I’m thinking of changing the handlebars and seatpost, and I’d love to repaint it, but don’t have a clue as to where to start! I’m also wondering whether it would be worth it to change the derailleur and make it an 18-, 21- or 24-speed?? Any other ideas for refurbishing it would be welcomed! I ride exclusively on pavement–city streets, country roads and paved bike paths, and live on a steep hill and in an area that is quite hilly. Others more experienced may submit comments that conflict with mine since I’ve never upgraded an OTS, but nowadays, an attempt to go to an 8-speed could involve more pitfalls than you may want to get into, like at least a new 700c rear wheel using a cassette hub, and possibly a new crankset (if an 8-speed chain is narrower), not to mention your brake calipers would need to accomodate the slightly smaller rim size of the 700c (compared to 27″ wheels). The rear triangle would have to be cold-set and aligned, also, by someone with that experience. I recently examined the same situation with my old road bike(s), and since I’m not a politician, rather than throwing money at the problem, I’d leave it as it is, and find another used bike that would already have a triple crank and more sprockets. This unfortunately usually means a “mountain” or “comfort” bike, unless you find a nice, old, drop-bar 15 or 18-speed “touring” (randonneur-style) bike, like a Trek 520, Schwinn Voyageur, or Miyata 1000 from the 1980’s, but they aren’t all that cheap, either. If you’re going to look at newer bikes, many entry-level drop-bar “road” (besides current “touring” and “cyclocross”) bikes have a triple cranksets, but prices begin around $600. Talk to your local bike shop about your concerns. Good luck. buy something else to tinker with. Nice bike. 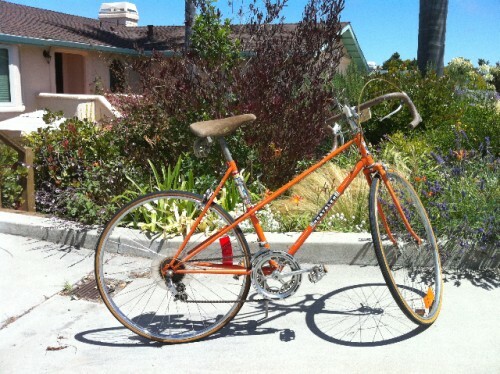 Hi Sandi, I have the same bike in a men’s frame; not mixte. I was a bicycle enthusiast back in the seventies. Hosteler was a reputable French bike maker back then, but got swallowed up when importing racing bikes to U.S. got strong. You won’t find many like yours since mixte frames were less popular and Hosteler imported for a short time. If it is in good condition, I would not make changes from the original paint as it may be of interest to a collector. You could probably get what you paid for it or more to the right buyer. Modifying the rear gears to a wider range cluster would be your simplest solution without huge expense. Find a shop that will change it for you and save the original equipment. You may even be able to squeeze a six gear cluster on, but make sure the rear derailleur can manage the largest gear. Very cool bike. Hosteler was not a big name in racing but produced very good frames with reliable components for touring with a racing feel. If you know anyone interested in a seventies vintage French racer, send them my way. I have two Tour de France top winning models: Motobecane Team Champion, and Peugeot PX-10. My brother had a men’s version, oddly enough we lived in southern Minnesota when he bought it , mid 70’s. I always loved that bike, non-metallic lime green. It was a great ride, I think my mom sold it at a garage sale, probably got $5 for it. Thanks for sharing, it brings back memories. I wouldn’t touch the paint, if it’s in good condition, you probably can’t match it, and will never find new badging.